Ah, January. A clean slate for a new year. For me, that means it's time to get organized. New budgets, new binders, new menu planners (this year I'm using the Dutch kookagenda I received from my in-laws--more on that in a future post). I see a lot of organizing in my plans this year in the de Jong Dream House. We've been moved in for almost a year so we have a pretty good idea of how we function on a day to day basis. 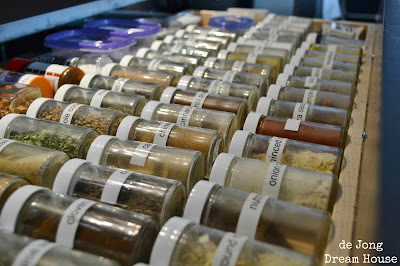 One of my favorite organized spaces in my spice drawer. I cook most meals from scratch every day. (My son is allergic to dairy so it's easier). When we were planning our house, I really wanted a spice drawer under the cooktop. Some kitchen designers said it wasn't possible, but our amazing carpenter made it work. I used tension rods from Target to create the dividers. We could have spent a lot more during construction to have dividers put in, but this is more flexible and allows for more options if I ever change the type of jar I use for the spices. The drawer is full extension, which is really convenient because it allows me to house all of my spices there. Of course I had to use my label maker. Here you can see the drawer in context. The other two drawers and nice and deep for all my pots and pans. I just love having everything I need right there. In case you're wondering, we buy our spices in bulk at a local store. They come in these convenient containers, which will fill up my little jars about three times. When I buy spice, I write the date on the container, like this. I keep all overstock spices in our freezer. I didn't used to date my spices, but now that I have, I know that I go through a larger container about every six months. Because of the quick turnaround, we don't have to worry too much about damage to the spices being under the cooktop. It's a great solution for us. In case you missed it, you can tour our whole kitchen here. I'm happy to say that our original organization is still holding up. Thanks for stopping by! We'd love if you follow us on Facebook and/or Pinterest. love it! Do you think the stove puts off enough heat below to affect the spices? I did have some concern about that, but my spices have held up really well. I do rotate through them pretty quickly so they don't have much time to go bad. That is amazing! I never would have thought of it. Beautiful! Thanks! Tension rods are my best friend. I have them hung under our sinks to hold cleaning bottles. I use them in our deep sill windows for curtains, too! that is totally bringing me to my happy place :) i love a nice organized kitchen! Thanks! We are kindred spirits! Wow, Jen! Great idea with the tension rods. Thanks for sharing and linking up at my social hop. Yes! And much easier than walking around the island like I had to do in our old house! That is a wonderful idea and less expensive to boot. Thank you for sharing. Visiting from Overflowing with Creativity. Yes, it was MUCH less expensive than the custom inserts...and offers more flexibility. Wow!! That is genius!!! What a great idea! I host a weekly Friday link party that I would love for you to link up at if you are interested. I can't wait to check out more of your site! I love this! How smart are you...now if I only had enough drawer space to carry this out! I was just looking at your kitchen. Do you ever use that desk area as a baking center. I purposely put in a lowered counter so I would have to knead bread in heels! It would be pretty easy to add a drawer there and still be pretty close to your stove and prep space to the right of it. This is so clever! Thank you so much for visiting my link party! Can I just start off by saying I LOVE YOUR KITCHEN!!! I live in a tiny apartment with NO counter space in my kitchen, and I am SO JEALOUS. That's a huge drawer! And you did an incredible job! Wow. Thanks for linking up to the Craft Yourself Crazy link party! Thanks! We lived in a little apartment for a few months when were waiting for this house to be finished. My counter was about 2' by 2'! I did a LOT of crockpot cooking! Thank you! I am so happy we did this. I use it multiple times a day! This is such a great idea! I never would have thought of using tension rods in a drawer! Thanks so much for linking up at Thrifty Thursday--we'd be glad to have you back anytime! Thanks, I'll be back. 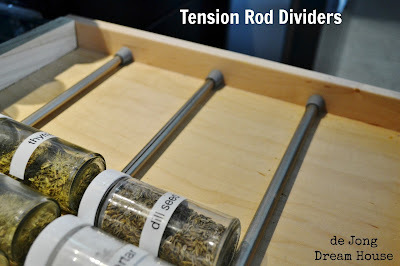 I'm working on a post of all the ways I use tension rods to organize. Hi, I love your beautiful home and kitchen! The tension rod ideas is genius, pure genius! lol! Hopped over from Tuesdays Treasures. I have a link party, Share Your Cup Thursday. I would love if you shared sometime! Thanks. I'll check out your party this week! Just a suggestion, I would put your follow button more towards the top. Took me a while to find it sweetie! Thank you! We've been making some cosmetic changes and I didn't see that it was stuck down there. This turned out beautifully. I love how the molding echos the windows. This is such a smart fabulous idea! Thanks for linking up! I am showing this off on my blog tomorrow! Great idea! Do you recommend most people have it so near the heat source, though? i also want to make sure that my kids don't get into one of those vertical pull-racks.... this does seem like a better option. Or a spice rack mounted on the wall. Have you ever had that? Do you have a preference for one or the other?